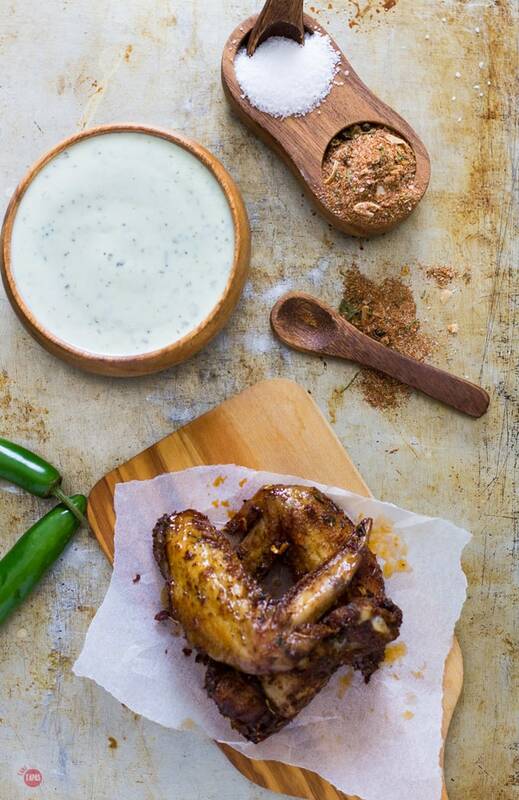 Baked Crispy Jerk chicken wings dusted with Jamaican Jerk Seasoning are the perfect start to any party! Flavored with allspice, cinnamon, and spicy cayenne, they will get your mouth watering! In my last post, I showed you my recipe for Homemade Jerk Seasoning Mix. I discovered jerk seasoning on my honeymoon to Jamaica in 1999 when we stayed at a Beaches resort and ate everything in site. 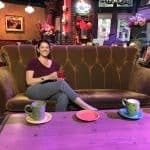 Brooks fell in love with the Blue Mountain Coffee and I fell in love with unlimited drinks, the rum, and all the food you could stand. The jerk seasoning that they had on their chicken was amazing, I just had to make my own jerk chicken wings at home. Now you know I love chicken wings. They are the perfect snack food that doubles as a meal. I could eat chicken wings all day long. In fact, when I was pregnant with my oldest son, I forced my hubby to eat at Hooters three to four times a week. Not that he complained much about that. Now I make my own Jerk chicken wings at home. Check out my Southwest and Crispy Green Herb versions too! 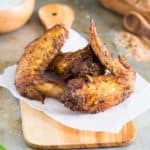 The Jerk chicken wings are easy to prepare! Just throw the wings in a zip-top bag, add some of my Homemade Jerk Seasoning and a few tablespoons of olive oil. Squish the bag around to spread the seasoning evenly over the wings. Let it sit for about an hour, or overnight if you want. It does get hotter the longer it marinates. When you are ready, bake in the oven for about 45 minutes, depending on how crispy you like your wings. 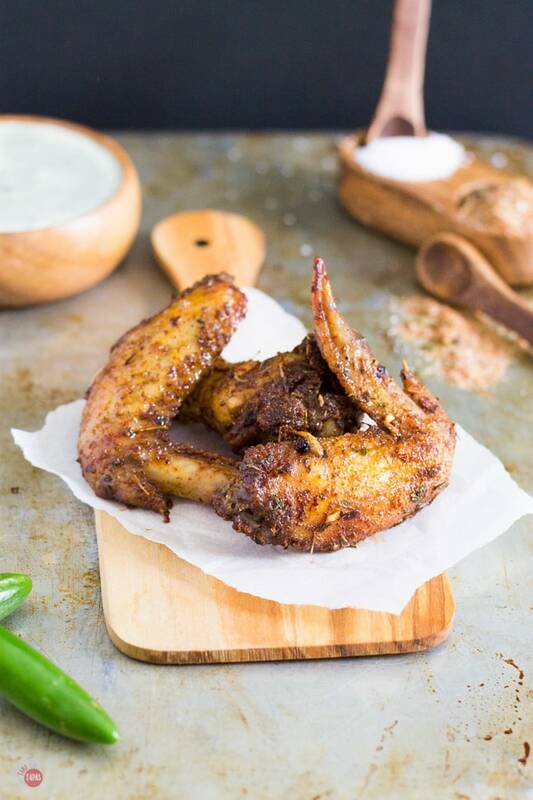 I love to make chicken wings at home because they have to be super crispy. Every time I go out for wings they never make them crispy enough or they sit in their sauce until they get soggy again. 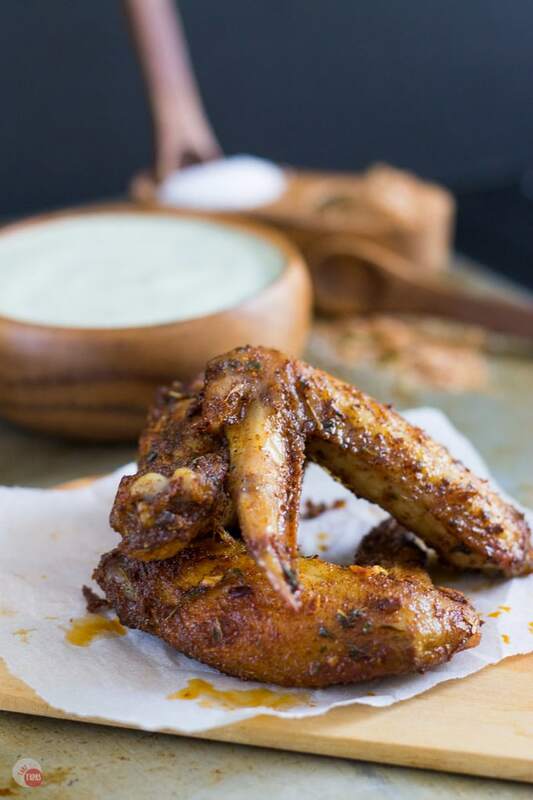 If you hate soggy chicken wing skin like I do, use this rack to bake your chicken wings. It brings the wings above the pan so they are not sitting in their own juices while they cook and the skin can crisp up on all sides. 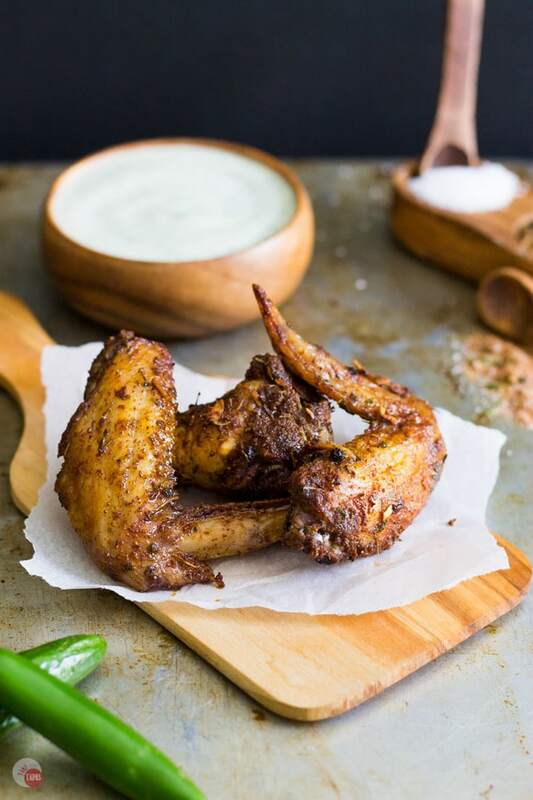 I served these Jamaican Jerk Chicken Wings with Cilantro-Ginger Avocado Cream Sauce because the creaminess helps cool down the heat from the Jerk seasoning! Feel free to dip the wings, drizzle it on the top, or just stick your face in it after you eat too many wings and your lips are on fire. Combine the wings, olive oil, Jerk seasoning mix in a bag. Mix to coat the wings and let marinate for at least an hour. Spray with some non-stick spray. Lay the wings in a single layer and bake for 40 minutes or until crispy. Serve with Cilantro Ginger Avocado Sauce. *If you like this recipe, comment and rate it with some stars! Thank you! I just love jerk. Can you use vegetable oil if you run out. Thank you so much! We loved all the Jamaican food we had on our honeymoon and want to go back there soon! Oh my gosh, these look so good. If I could reach right through the computer, I would! Thanks for sharing with us at Share The Wealth Sunday. I hope we see you again tonight! I love wings! Did you know this Friday (July 29) is National Wing Day!! Thanks for sharing on the What’s for Dinner link up! These looks great, and the dip recipe looks amazing!! Pinning. Thanks for sharing on Family Joy Blog Link-up. Please come back and join us again! A recipe with some heat my husband would enjoy. A dish my husband would enjoy! He likes some heat. Thanks for sharing on Family Joy Blog Link-up. Please come back and join us again! Sriracha pineapple please! Looks beyond amazing! Thanks, Michelle! Those are great too!